Visual Paradox: Frequently asked Questions - What is 3D rendered art? 3D Images are created using mathematical formulas that calculate light reacting with objects just like in the real world. So using a modern 3D drawing program is more like sculpting and photography rather than just drawing. 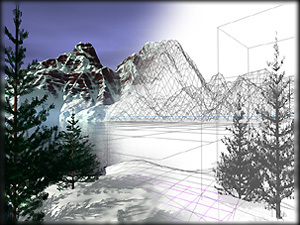 A mesh or grid is manipulated into a 3d shape, and a texture map (image) is wrapped around it. Lights get positioned, and a camera determines the final image. Since everything in the scene is three dimensional, moving the objects, lights or camera can produce amazing animations.